Moore's Guide was written when King George III was on the throne and his son, who later became George IV, was Prince Regent. Henry Moore was an author, painter and etcher of Green Lane in Derby. He invented "a method of engraving or etching in white line on the surface of polished black marble". ** This extract about Matlock and Matlock Bath, from his book "Picturesque Excursions", contains a selection of his lovely etchings. pp.20-27 - TO WILLERSLEY CASTLE, AND THROUGH MATLOCK DALE. With etching of " Matlock Church"
pp.27-32 - With engraving's of "The Dungeon Tors" and "Romantic Bridge Rutland Cavern"
pp.32-36 - With etching "View Opposite the Museum"
pp.36-41 - With etching "View From Mason"
pp.42-46 - With etching "The High Tor"
To THE HIRST STONES, CAWDOR TORS, VILLAGE OF MATLOCK, RIBER HILL, CASCADE, AND CROMFORD BRIDGE. A Royal Visitor used Moore's book. "The Grand Duke Michael's Tour". 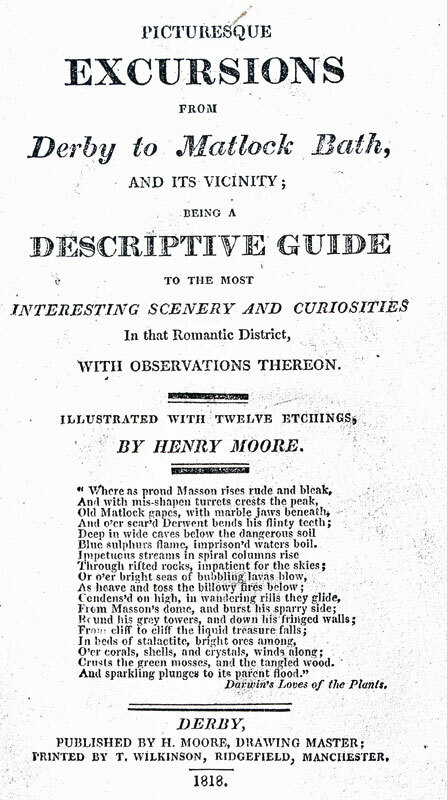 "On arriving at Matlock, his Imperial Highness and Suite having provided themselves with the new publication Picturesque Excursions in the Vicinity of Matlock, by Moore. They immediately went to the Grand Rutland Cavern, where they remained exploring the interior, with which they were highly gratified ; for this excursion every poney was put in requisition, and his Imperial Highness and Suite ascending the heights of Abraham, by the new zig-zag walk, forming a group as extraordinary as novel, replete with drollery and good humour. So gratified was he with the cave scenery, that he could not be prevailed to visit any of the inferior caverns, exclaiming, "I shall never forget the Grand Rutland Cavern". His Imperial Highness visited the Museum and on being informed it was patronized by his Grace the Duke of Devonshire, he condescendingly bestowed many eulogians on the establishment, and bought a variety of vases, &c. - he then walked, and took the waters at the New Fountain, and proceeded on horseback to Chatsworth to dine". **Quoted from Alfred Wallis, "Some Reminiscences of Old Derby, No.25", 1909. DLSL, Ba 900  in Jane Steer's article "The Site of the Hospital of St. Helen's in the 19th Century; Part 1. The Spar Manufactory", p.158. This was published in 'Derbyshire Miscellany' (the Local History Bulletin of the Derbyshire Archaeological Society), Vol 16, Part 6, Autumn 2003. The Spar Manufactory was on King Street/St Helen's Street, Derby and Henry Moore developed the method of etching for its eminent proprietors, Richard Brown senior and junior.